Daniel Lubetzky will be speaking about leadership and its impact on your business's bottom line at the Entrepreneur 360™ conference in New York City on October 7, 2015. Register now. As Daniel Lubetzky tells it, he was inspired to start a company that wasn’t constrained by trading one thing for another. That’s how the idea of a snack that’s delicious and nutritious came to life, all built on an underlying purpose to be more than a brand focused only on growing sales. The son of a Holocaust survivor, Lubetzky was inspired by hearing his father’s story of the small acts of kindness shown to him during a dark time. He vowed to focus on building bridges between people, while also building a business that upheld core values. After 11 years of failures from other entrepreneurial ventures, he finally penetrated the competitive natural snacks and bars category to create what is now KIND Snacks, a business that he dubs “not-ONLY-for-profit”. And profit he has, with more than a billion KIND bars sold to date and a solid nine-figures a year in revenue business. With a social mission focused on spreading kindness to others, he has found a way for KIND’s business objectives to live in harmony with its social objectives. He recounts his trials, tribulations and best entrepreneurial takeaways in his new book, Do The KIND Thing: Think Boundlessly, Work Purposefully, Live Passionately. I had the opportunity to speak with Lubetzky about the book and some of his best lessons, which I recount below. Lubetzky believes that one of the biggest mistakes that social businesses make is focusing more on the mission than the product. “Your social mission doesn’t sell product. It gives meaning to the company,” he explains. What sells the product is focusing intently on making the product the best it can be. For KIND, that was making a product that was delicious and nutritious. 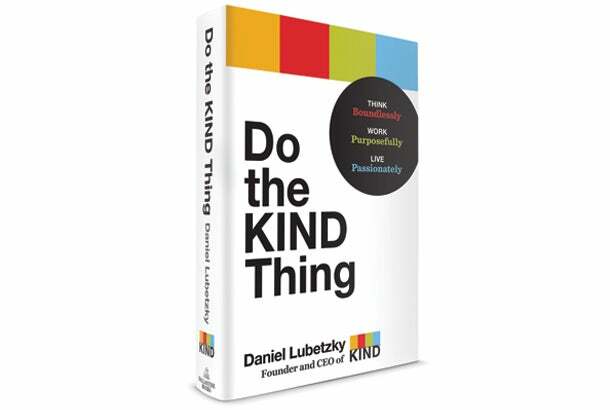 Lubetzky says that most people don’t know about KIND’s mission when they first try and buy the product. “Your social mission can’t be a crutch,” he says. It does, however, give you an opportunity to deepen your connection with the customer after they are hooked on the product as an extra bonus. Moreover, when a business is purely premised on a social mission, he believes that the business is likely to have a shorter shelf life if the consumers don’t believe as strongly in the business as the product. Lubetzky advises to think creatively about the business model and the social mission in order to, “pursue similar compatible goals in tandem.” It’s about keeping the business mission and the social mission aligned and advancing both goals together -- finding ways to make one plus one equal four. One of the highlights of Lubetzky’s book is where he discusses the different phases that a business goes through. This includes the “Skeptic” phase when starting a venture and the “Evangelist” phase when executing the venture. Lubetzky says that you neither want to “waste your life or give up too early” when it comes to your business. First, you have to be skeptical, advises Lubetzky. You need to be your own biggest critic, taking no issue for granted and asking yourself the toughest of the tough questions. This is to ensure that you really are pursuing the right opportunity. In the book, Lubetzky transparently highlights his many mistakes made over 11 years before starting KIND. He says that in every step, from launching too many products that made him distracted to cutting corners that eroded the brand promise from spreading himself too thin when it came to sales, he made mistake after mistake. However, with introspection, self-criticism and analysis, he was able to derive important business lessons, eventually becoming much stronger and honing his instincts to avoid making the same mistakes in the future. He believes that entrepreneurs shouldn’t let their failures stop their efforts, but rather inform their future efforts. Lubetzky says that while his financial investors are important to the company, the team invests it’s time, energy and talents in the company every day and therefore, are important investors too. He feels so strongly about this that all full-time team members are given the opportunity to become shareholders in the company. “Regardless of the role, whether they are cleaning the offices or sitting in the offices, if they are full time staff, they get stock options in the Company,” says Lubetzky. Giving team members stock options helps to give everyone a stake in the mission and the success of the business. He also took (and recommends) a similar focus on a slow build not just by geography, but by sales channel as well. He launched KIND in natural and health-oriented retailers, and then moved to specialty retailers, and then to the high-end supermarkets before bringing the products mainstream. While it’s challenging to get that first push and to displace an existing product to get that shelf space, you need a lot of pull to be successful. This means that you need to do things to help build up the consumer demand in the market so that they not only try the product, but come back and buy it over and over again. He advises that you build both your relationship with the consumer and your partners (such as distributors, retailers) in parallel paths, but not to get too far ahead of yourself or you do a disservice to both.